The burgers are battling, so you get special pricing! Usually about twice a year, Fireside has special pricing on grills that have been used 1X. And this fall is that time of the year! On October 4th, the annual Boys and Girls Club Burger Battle will take place and Fireside sponsors the grills. This year there will be 8 teams competing and that means they will be cooking on 8 Kamado Joe’s! 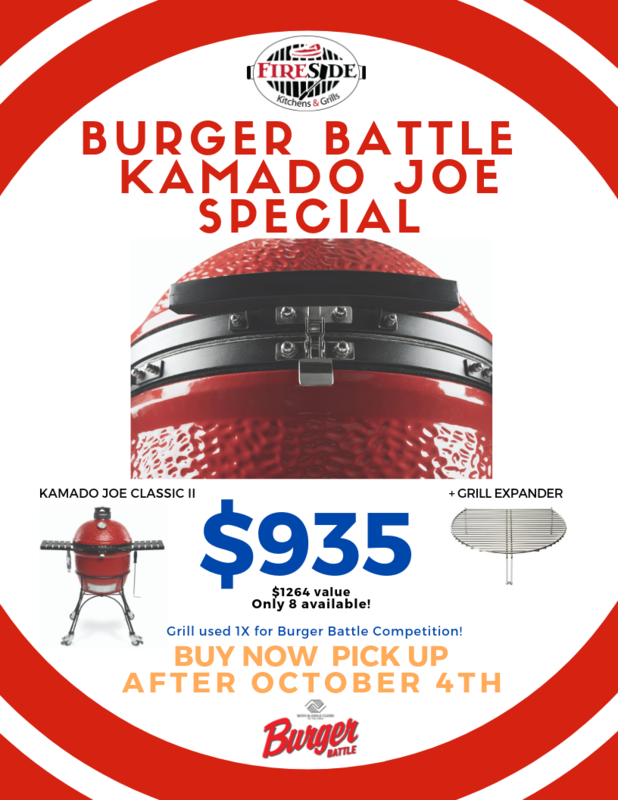 If you have been waiting to get a deal on a Kamado Joe, NOW is the time to come buy your new favorite grill! Don’t wait on this deal because there are only 8 available and these will sell quickly. You can get a Kamado Joe Classic II and grill expander for $935. You get a $329 savings with this grill package and the grill is already put together. These grills will not be available for pick up until after Thursday, October 4th. So, spread the word! And if you already have a Kamado Joe, make sure you let your brother, co-worker and neighbor know about this deal. You know they always talk about your grill and how they want one of their own! Now is the time! Come get a Kamado Joe at Fireside so you can FIRE IT UP this fall! Hi, Darren. Yes, we do have ONE left! You can call the store at 706-722-3939 to claim it.